You know how I LOVE floral anything, pretty much, and when it’s in shades of PINK, like a pink floral top, it will always be FABULOUS!!!! I have worn this top several ways, (right here) but my first choice will always be with a great pair of jeans! 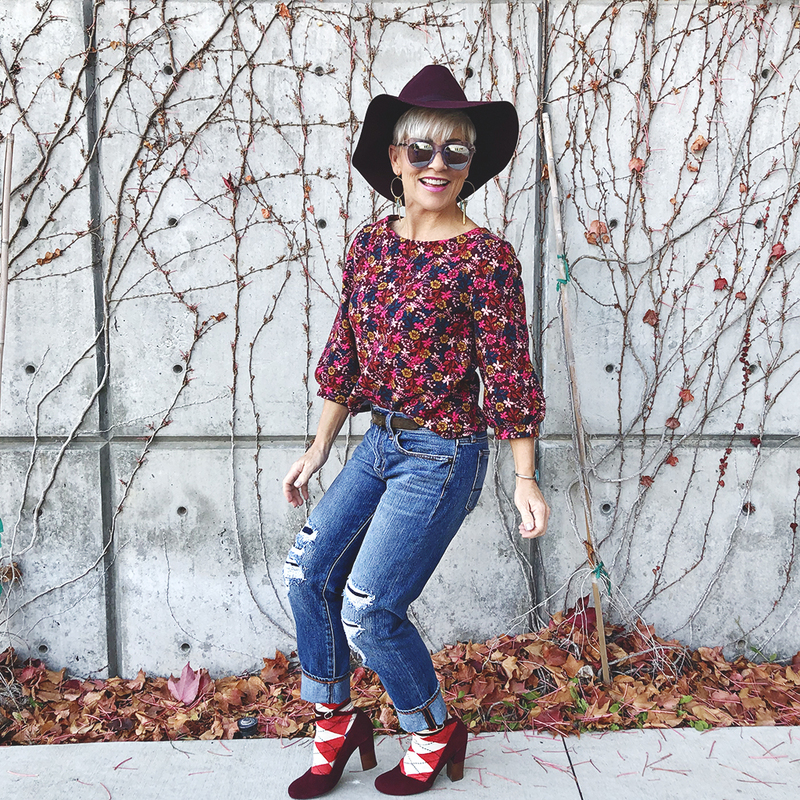 And these are my favorite boyfriend jeans, and very vintage…..well a few years vintage! I’ve linked a similar pair right here! I like these because the rips don’t go all the way through to the skin. The ones linked are the same way….still cover, but still lots of good distressing! And what about the heels and socks?? Some say NO WAY, some of those Facebook friends will say NOPE! Ha! But I say YES because it’s very cute! Get yourself a coordinating pair of socks and wear with some wine colored suede or velvet shoes and you will be so sassy and fun!!!! I just pulled similar colors out of the top to match the socks, but a contrasting color scheme would be cute too….like blues for example! I LOVE socks and heels together!!!! How would you STYLE this top? I’ve worn it with cords, a brown leather skirt, and jeans! You could also wear it with trousers for a more professional look! I would choose maybe a gray subtle pinstripe, or a solid color. The top is knit and so very easy to care for on your own, and very comfortable! Everything I’m wearing here except for the top, I’ve shopped my closet for. So I’ve linked some similar shoes, and more similar shoes, a hat, and some coordinating socks! I’m wearing GrayC Glass jewelry~ earrings and bracelet! Have a super GREAT and SAFE and FESTIVE and HAPPY week friends!